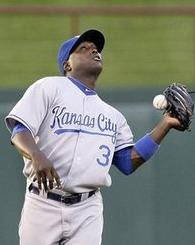 I'm still trying to process the move that Kansas City made late last night. I mean, surely this is the year Yuniesky Betancourt breaks the 25 walks barrier. But the Royals decided to build a package around him and sent him to Milwaukee for fellow short stop Alcides Escobar and three Brewers' prospects. Congratulations are in order to blogger Jim Breen of Bernie's Crew for breaking the story yesterday. I broke a news story once and, damn, it felt good. But enough about me, let's get to the trade. The Royals upgrade their short stop position by trading for an actual short stop. Escobar is great in the field but is still a work in progress at the dish. As brain cramping as it is to imagine, Escobar couldn't even out on base percentage Yuni last season tying him with a walk refusing .288 OBP. Escobar just turned 24 so Royals fans can be at least a little optimistic about some room for growth and can take comfort in the fact they'll no longer be running out a traffic cone in the field. The Royals also get the Brewers number one prospect in RHP Jake Odorizzi. Odorizzi was the Brewers top prospect for roughly a week after Milwaukee sent Brett Lawrie to Toronto. Toolsy center fielder Lorenzo Cain is the only other confirmed prospect in the package. Early reports had RHP Jeremy Jeffress in the deal but he's now apparently been replaced with the famous PTBNL. That could potentially be good news for the Royals since Jeffress projects as a reliever and already has a 100 game suspension under his belt. The Brewers continue to gut their farm system in an effort to go all in for Prince Fielder's last season in Milwaukee before he packs up all the cheese he can and files for free agency. The Brewers are getting $2 million which is what it would cost to buy out Yuni's contract just in case they find an elderly lady in the stands with better range at short stop. The Brewers will also acquire Zack Greinke pending a physical. Grink? Am I saying it right?